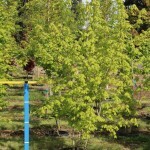 A slow growing maple that is native to stream banks in the Intermountain West. The form is usually shrubby, rarely trained into a tree. 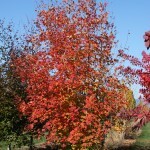 Dark green foliage turns brilliant shades of red and orange in the fall. The bark is thin, smooth and gray. It is tolerant of drought and alkaline soils. Also known as Canyon Maple or Wasatch Maple. 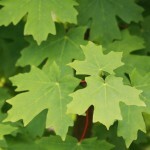 It is a western relative of the Sugar Maple, and sometimes described as a subspecies of Acer saccharum.